Are you in need of a few stocking filler ideas or do you need something a little bit different for your Secret Santa this year? 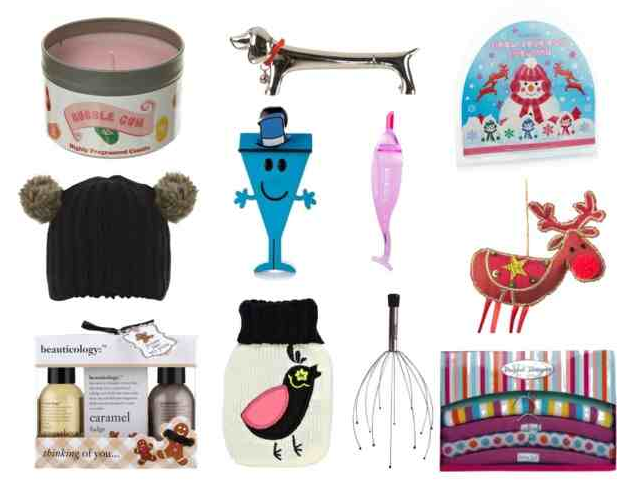 These are my ideas of what you could buy, and amazingly, they're all under £5! Jelly Belly Candle - Available in Bubblegum, Cherry or Toasted Marshmallow, these are a great novelty candle idea to give as a gift, and they actually smell really nice! Doggy Pen - A useful, yet fun gift for a man or woman... idea for a Secret Santa gift if you work in an office, or for any animal lover. I think this is super cute. Make Your Own Snowman - A daft novelty, but definitely fun for any Christmas lover. Bobble Hat - A nice practical gift which anyone would appreciate, yet it won't break the bank. Mr Man Ice Scraper - Ideal for an extra pressie for the man in your life, or a friend... anyone with a car really, I love it because ice scrapers are usually plain and boring. Bourjois Eyelash Applicator - Any beauty loving lady would love this... I'm hoping someone buys me one because I'm rubbish at putting on fake lashes. Reindeer Tree Decoration - This is a fair-trade decoration from Oxfam, so you can do your bit for charity while buying someone a cute decoration that they can use over and over again. Beauticology Gift Set - I got some of these products for my birthday, and they smell amazing! An easy gift to buy, which anyone can use, and I'm sure they'll love... they actually smell good enough to eat. Bird Hand Warmer - This is also available in pink with a cupcake design if you're looking for something girlier. Perfect for a Winter present... I'd love one of these. Head Massager - I was given one of these a few years ago, and they're the best! Sooo relaxing... if you haven't used one before, buy one for someone just so that you can borrow it! The best £5 ever spent! Are you buying for a Secret Santa this year? Hopefully I've helped out with some ideas! These are great ideas at a great price! Great ideas, its so hard staying in a secret santa price range!